Those fighting to destroy the world fastest are a small group of privileged, greedy industrialists and financiers. Whatever size this demographic is, and whatever amount of financial and material resources it commands, these people and their institutions reach down the social pyramid and encourage all those glad to utilize global-warming machinery and practices for profit. • 40% of phytoplankton in ocean water is gone, the basis of the seas' food chain and the "blue lungs" of the Earth of oxygen. Acidification from CO2 in the water and ozone layer depletion are the culprits. Toxic plastic debris is increasingly more plentiful than zooplankton. • The combined energy content of methane hydrate in the Arctic far exceeds all other known fossil fuels' quantity, according to the U.S. Dept. of Energy. The implications of this methane ice continuing to rapidly melt and bubble to the surface are staggering, when methane is 23 times more powerful than CO2 as a greenhouse gas. And when methane explodes it gives off heat and CO2. • The risk is to far more than "civilization's legacy," as voiced by NASA's James Hansen, who with Al Gore broke the story that global warming has begun (1988 Senate hearing). Hansen speaks of tens of meters of sea-level rise destroying much of civilization. The loss of life, and the additional CO2 feedback of land vegetation killed that becomes a huge carbon source, is more important than civilization's legacy. Before civilization there was no problem. Can we live without civilization? It would be more than iffy, to the billions depending on petroleum today in some way. But would you like a stable natural environment sans civilization if that was a choice, doing without the trappings of civilization and rampant technology that threatens all life today? A greener clean-tech economy is a pipe dream if not implemented in such a way to not only immediately stop, but reverse, greenhouse gas emissions and their effects. • Recent research on happiness has shown that achieving a closer sense of community and practicing more personal expression provide far greater rewards than what materialism and consuming can give. Now being added to the growing Happiness movement is consciousness of environmental sustainability, as an essential personal and collective pursuit. Happiness is compatible with sustainability, whereas materialism and economic growth are not. • Appropriate Tech, a catch-all for efficient use of local resources that leaves or renews them for future generations, is on the rise: there is more bicycling, farmers markets, permaculture, rediscovering our ancestors' skills and crafts, decentralized renewable energy systems -- all are opportunities to get involved and cut one's costs of living, and are available and thriving. • Rethinking world trade and travel has hit mainstream media (BBC, CNN-Int'l) with coverage of the sail transport movement. While cargo ships running on bunker fuel comprise "only" 4% of global CO2 emissions, just 16 (sixteen) vessels spew as much sulphur and other pollutants as all the world's cars. The 70,000 or so cargo ships burning oil have had to slow down to 15 knots, the speed of the old clipper ships of 150 years ago, to save fuel and cut costs. • The survival instinct is high for everyone, except for certain demographics committing suicide in high numbers (military personnel and veterans of U.S. oil-related wars). The only trick is to get people to take sensible action, such as with the above points, on their food security beyond their current employment period that can end suddenly. Relegating the preoccupation with national electoral politics to secondary concern means "going local." National office is dominated by mega financial interests such as fossil fuels industries and motor vehicle corporations. Going local can include "going loco" for protecting Mother Nature and one's family and friends. What may be viewed as insane or extreme today may be someday be viewed as reasonable and better-late-than-never. Community self-reliance will be increasingly necessary when the instability of oil supply culminates in a crisis of employment, transportation and food growing & distribution. Examples of going local mean buying no products from out of one's bioregion if at all possible (unless brought by near zero-carbon sail transport). This is not so hard, when even a car-dependent person justifying daily driving can always buy a used car, thereby keeping money in the community. Chapters or any formation of Ice Defenders can pursue relocalizing and any form of protection of Arctic ice. Spreading the news about protecting polar bears as an endangered species is helpful. But iconic animals are increasingly impossible to save, at this point, with legislation. Because desirable new laws, even if passed, will not dismantle or replace widespread, ubiquitous petroleum consumption, nor the buying of unnecessary new corporate products. Joining a Transition Town group or other environmental group is helpful, but the approach of such membership/meeting groups has not kept pace with the drift toward climate extinction. Greenpeace and Earth First! have been active for decades but have not succeeded overall. So a new ethic to appeal to the average person's idea of safeguarding a so-far-benign climate has to be instilled. Making popular the mission of Ice Defenders (or the equivalent) is key. Vilifying or criminalizing climate destroyers could come into vogue. Acting to protect Arctic ice, wherever one happens to live, can be done via education, direct action and trying to break through the corporate media complex. But if that approach fails, Plan B would be to anticipate economic collapse that is happening already in large part due to the destruction of nature. Questioning the sacred cows of growth of civilization and population must be done by a critical mass; it has heretofore been limited to intellectuals -- many of whom do not limit their own consumption. Even the Occupy movement has been saddled with the idea of exceptionalism, the misconception that middle class affluence is the natural norm and a right for all. But the Occupy movement is proof that mobilization of masses can happen suddenly, boding well for a climate protection movement that goes beyond the good work of 350.org and others. Why the Occupy movement abated and stalled may be due to the lack of connection to the land: occupying the commons for food security didn't happen except perhaps with the confrontation with the University of California Berkeley over the Gill Tract farming insurrection. "Living the future now" needs to come about voluntarily and made popular and alluring. Just how this is approached is for the individual and the community to decide. The "carrot and stick" can be applied variously. Imagination regarding what constitutes rights, opposing the prerogatives of private property via civil disobedience, will come into play. The arts and the formation of nonviolent affinity groups, clandestine or high profile, can involve everyone. 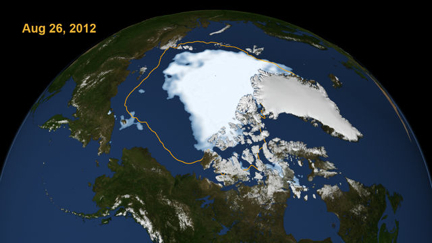 It all comes down to "Anything goes in defense of Arctic ice." The goal is to launch this principle before calamities such as food riots and unnatural disasters from climate chaos take hold of major populations. For this would worsen the ability of people to plan for and salvage a sustainable future. Shall we bring back the Alliance for a Paving Moratorium's bike sticker "Turn the ignition, melt a glacier" in massive quantities to apply on cars? Take the Pledge for Climate Protection	- ten vital steps to slow global warming and climate destabilization that also prepare for petrocollapse. Quote: "• 40% of phytoplankton in ocean water is gone, the basis of the seas' food chain and the "blue lungs" of the Earth of oxygen." I had read that claim somewhere and, shocked and numbed, went to find substantiation for it. None was to be found. I guess some "study" was published somewhere.... But the trail went dead. I don't think any credible oceanographer or biologist will let this claim have a pass. That said, I'm all for putting a quick end to the fossil fuel culture and economy. But we need to do our fact checking if we want to be taken seriously. I've got too many items I'm researching to get to the bottom of some issues quickly. It seems the controversy about phytoplankton decline is ongoing. And it's not a simple matter to reach conclusions upon. If indeed there has been a 40% decline in recent time, that would indeed be rather frightening. Wish I had time to visit this website more often, mostly agree, good articles. But one suggestion: the phrase "the misconception that middle class affluence is the natural norm and a right for all" will be misunderstood by many who will think that the speaker is blind and deaf to the suffering and economic insecurity of the U.S. middle class. How about "the misconception that the wasteful nature of much of middle class existence [is necessary/is the norm]" must be questioned? Both are true: on the one hand, the economic insecurity, job insecurity, healthcare insecurity, etc are very real and to reach out to fellow Americans (or USAians) we need to be clear that we understand...while at the same time recognizing the fact, and helping them see, that they are also (in part forced by lack of mass transit, sprawl, lack of consumer choices, etc, as WELL as consumer choices where they let advertisers misdirect them) are unnecessary, in fact harmful, to their own personal wellbeing as well as harmful to the planet. This suggestion is not the same as, but somewhat similar in flavor to, another - that we not talk about "we need to stop the high standard of living" (which is not what we mean at all)but talk about "we need to stop the high-consumption [often high-insecurity, high-stress, low] standard of living". Say quality of life when you mean that, say consumption when you mean that, and not mix the two up for others or ourselves.